Intimate partner violence (IPV) is widespread globally, with estimates showing that nearly 1 in 3 adult women worldwide have experienced some form of IPV. South Asia has among the highest regional rates in the world, with 41 percent prevalence of IPV. In Bangladesh, one survey found that 72.6 percent of married women reported experiencing violence at the hands of their husbands, and another showed that 74 percent of men reported inflicting violence on their wives. Violence against women in Bangladesh can be linked in part to strict observance of gender norms. Even though gender equality in the country has improved in some dimensions in recent decades, studies have found that patriarchal gender norms persist in much of rural Bangladesh. Purdah – the practice of female seclusion – is widely prevalent, and women’s movement outside the home continues to be restricted. Many women have little control over finances and limited social support, leading to reliance on their husbands and little bargaining power within their marriages. Past studies (Angelucci, 2008 and Bobonis et al., 2013 in Mexico; Hidrobo et al., 2016 in Ecuador; Perova & Vakis, 2013 in Peru; Haushofer & Shapiro, 2016 in Kenya) have shown that programs that target food or cash transfers to women can reduce IPV – an encouraging finding, given that transfer programs are widely used as anti-poverty programming around the world. However, these studies do not tell us what happens to IPV after the programs end. Moreover, they do not tell us which components of transfer programs – which often include trainings and conditions linked to transfers – contribute to reducing IPV. Previous studies also draw mostly from Latin America, where gender norms differ from South Asia. Our research from a transfer program in Bangladesh shows that when only cash or food transfers were provided to women, there were no effects on IPV after the program ended. However, when the program combined the transfers with behavior change communication (BCC) that reduced women’s isolation and empowered them with greater knowledge and social status, IPV was significantly reduced months after the end of the program. 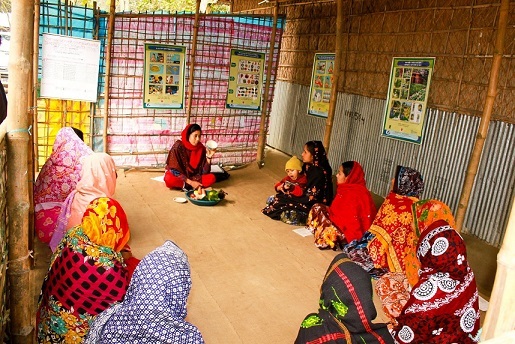 In collaboration with the World Food Program, IFPRI evaluated the Transfer Modality Research Initiative (TMRI), a pilot safety net program in rural Bangladesh aimed at improving household food security and child nutrition. Mothers of young children from very poor households were randomly assigned either to a control group or to receive cash or food transfers, with or without intensive nutrition BCC. The pilot ran for two years, from May 2012 to April 2014. Although there was no explicit gender- or violence-focused messaging in the nutrition BCC, it intensively engaged women. Components included weekly group meetings for the target women, led by trained nutrition workers (to which husbands and mothers-in law were also sometimes invited); bimonthly visits by nutrition workers to the women’s homes; and monthly group meetings between program staff and influential community leaders (such as village headmen, religious leaders and educators) to share the information being conveyed to women. BCC topics included basic nutrition, control and prevention of micronutrient deficiencies, infant and young child feeding practices, health care, maternal nutrition, and hygiene. Participation in the BCC was technically a condition for receiving transfers, but beneficiaries were not dropped from the study if they failed to attend a session; instead, a nutrition worker followed up with a home visit to uncover why the session was missed and shared the missed information. Nonetheless, women’s attendance rates were high. Anecdotally, women often arrived early for the meetings and stayed late to talk with other group members, finding it an opportunity for social interaction. Data on participant women, their children, and their households were collected from 2012-2014 to analyze program impacts on food security and child nutrition. To complement this analysis with an assessment of post-program impacts on IPV, IFPRI conducted another survey 6-10 months after the program ended, which included questions on emotional and physical violence drawn from the internationally-validated IPV modules of the WHO Violence Against Women questionnaire. In a recently-published IFPRI Discussion Paper co-authored with John Hoddinott and Akhter Ahmed, we find that transfers combined with intensive BCC reduced IPV even after the program ended, but transfers alone had no post-program effect on IPV. Specifically, women who received cash or food transfers with BCC experienced a 26 percent drop in violence 6-10 months after the program ended as compared to the control group (which received no cash, food, or BCC). However, there was no impact on IPV of receiving transfers only (with no BCC) 6-10 months after the program ended. What was responsible for these changes? We suggest three possibilities. First, food or cash transfers linked to BCC caused sustained increases in women’s bargaining power, more so than transfers alone. Women were more empowered due to the increased social interaction and knowledge gained from the transfers combined with BCC (which likely persisted after the program ended), making them less willing to accept violent behavior. Second, women’s increased social interaction made any physical violence more visible to the community. This increased the probability that men inflicting it would be caught and would face social disapproval, increasing the “social costs” to men of inflicting violence, even after the program ended. Third, combining transfers with BCC caused greater long-term improvements in household well-being than transfers alone. This eased poverty-related stress, a trigger for violence. This research prompts several questions for future study: whether these results hold for more than 10 months after the end of the program; whether a program of lesser duration than two years would have similar results; whether different types of BCC interventions would be effective; whether results would generalize to different settings or to women with different demographic characteristics; and whether a different type of transfer program that challenged gender norms would be effective. Our findings have important implications for policy making. In much of the developing world, cash and food transfers are widely used as policy tools. These transfers are a promising platform for IPV prevention. However, on their own, they may not be effective in sustainably reducing IPV. As our research from Bangladesh shows, integrating transfer programs with complementary activities (such as intensive nutrition BCC) that improve women’s status in their households and communities beyond the end of the program may be needed for sustainable reductions in IPV. For more information, contact Shalini Roy and Melissa Hidrobo. This story originally titled Cash or food transfers paired with behavior change communication can reduce intimate partner violence even after transfers end was first posted on the Sexual Violence Research Initiative blog. Research described in the blog was undertaken as part of the CGIAR Research Program on Policies, Institutions, and Markets (PIM) led by the International Food Policy Research Institute. Funding support for this study was provided by the Sexual Violence Research Initiative, the World Bank, and PIM. The study builds on research funded by the German Ministry for Economic Cooperation and Development, the UK’s Department for International Development, the Swiss Agency for Development and Cooperation, the United Nations Development Programme, and the United States Agency for International Development.